This plugin allows foes to automatically spawn when you enter a room. Should make RPG-type games feel more natural, especially with some upcoming interface updates. Basically, you can choose global spawn settings, room category spawn settings or room spawn settings. Global spawn settings happen everywhere within the game. The other two should be self-explanatory. Room category settings will override global settings and room settings will override room category settings. Chance -- The likelihood that an enemy will spawn when you enter the room. Total Foe limit -- The maximum amount of foes that can be in the room. Once this limit is reached or exceeded, no more foes will spawn via this system. -1 means there is no limit. Disabled -- This disables the spawn settings entirely. Weight -- If you have a list of foes here, the weight determines the likelihood that this specific foe will be chosen.. say Peppersnout's weight is 1 and GROOT's weight is 3.. that means a GROOT is 3x more likely to spawn than a Peppersnout. Auto-Engage Chance -- this is the likelihood that when the foe spawns it'll automatically engage in combat with you (and start at their turn). If you're running an RPG, you probably want this chance to always be 100. Limit -- The maximum amount of this specific foe that can be in the room. Again, -1 is infinite. Disabled -- This disables the specific foe from the spawner. 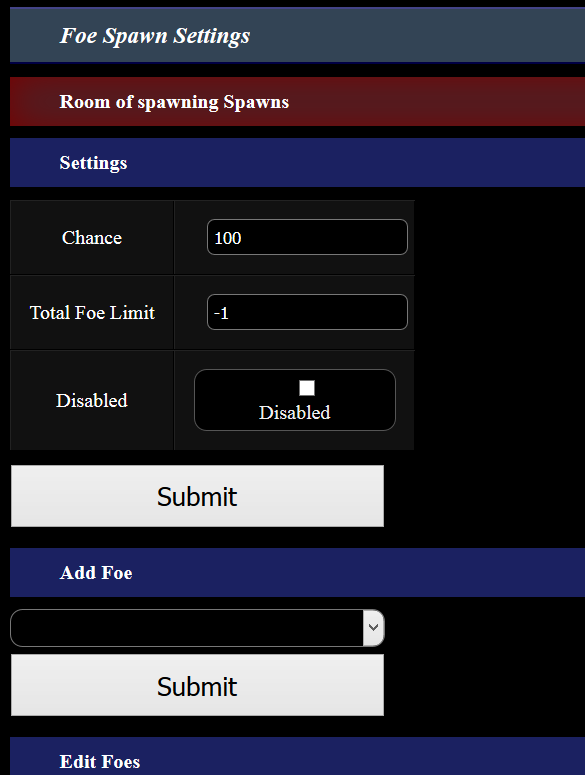 Spawn Conditions -- You can set some necessary conditions for the foe to be considered for spawning. In the above example, it has to be september or that foe just won't appear in the spawn list at all and something else will be chosen. Toggle Spawn -- Switches between the spawns being disabled or enabled. 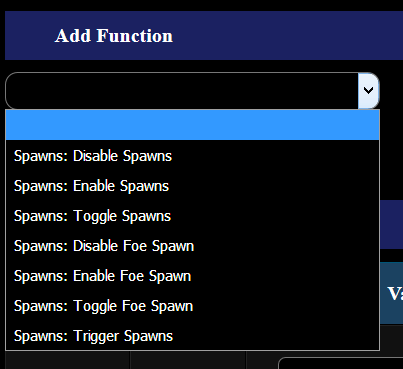 Disable Foe Spawn -- Disables a specific foe within a specific spawner. Trigger Spawns -- This will actually make a room do the entire spawning algorithm: choosing a global, cat, or room spawn setting, running the chance, picking a foe to spawn, etc. However it will not auto-engage. I kind of ran out of time on this plugin but was so close otherwise I just wanted to get it out the door. Probably during the polishing phase I'll pick it back up and do the All-death event portion of it.